"This recipe is from years of searching for the perfect English tea sandwich. I always looked forward to tea time in the Caribbean with my grandparents who were from English descent. My grandmother was French and my grandfather was from Guyana. My grandfather's parents were from England, so there is the British influence. You can add a teaspoon of dill to your spread." Beat cream cheese with half-and-half with an electric mixer in a bowl until smooth and easy to spread; stir in chives. Use a large round cookie or biscuit cutter to cut 24 rounds out of the bread slices. 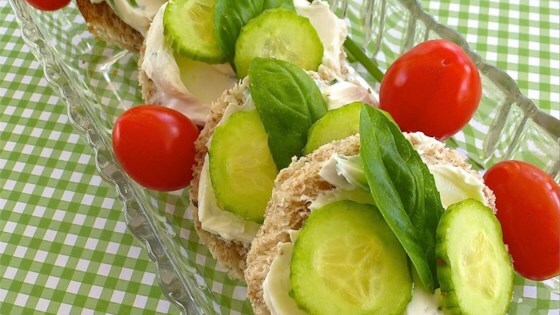 Spread each round with cream cheese mixture and top each canape with 1 or 2 thin cucumber slices and a basil leaf. If making ahead, cover tea sandwiches lightly with plastic wrap and chill.